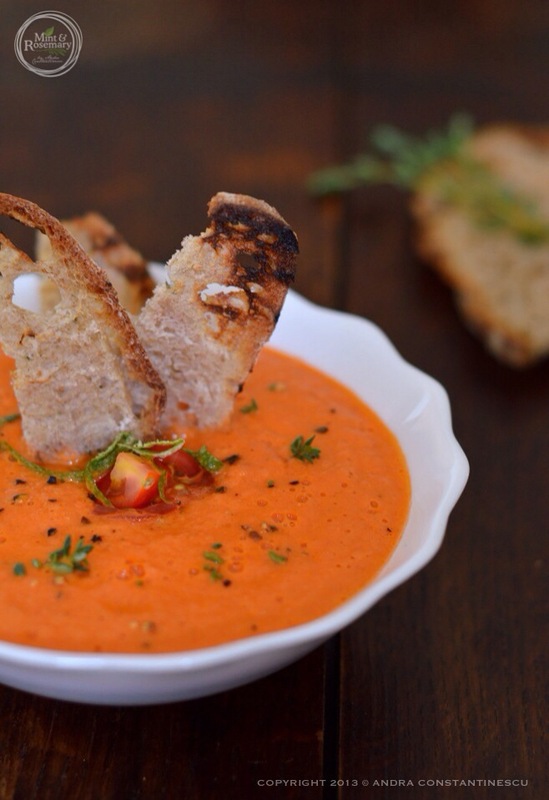 This spicy tomato soup is perfect for a summer lunch. Serve it either hot or cold, accompanied with a thin slice of grilled sourdough and some lime zest. Tomatoes are in full season in the summer time, and I can’t be happier! Usually I try as much as I can to avoid buying tomatoes from supermarkets when they are not in season, as they have no flavour at all, and I do suffer a bit, as I really love a good tomato and lately I am a big fan of spicy tomato soup. However, in summer time, things are getting better and one can find good quality tomatoes at the local farmers markets. As a big tomato fan, I eat them in various ways, but what I love most is experimenting, and trying to get out of the classic tomato and basil combination. Now don’t get me wrong: I could eat tomato and basil bruschetta every single day. But if we are talking about soups and other dishes, everything changes: I adore playing with spices, herbs and flavours. Last year I made this slightly different version of gazpacho, by adding fresh tarragon to it, and it was fabulous! For this year I thought at thyme – another big favourite of mine, but I also wanted a soup that could be served hot as well as cold, so I came out with this recipe. Roughly chop the tomatoes and the onion, then cut the red chilli in half and remove the seeds. Put them all in a roasting pan, add the thyme springs, sprinkle with salt and pepper then drizzle the olive oil on top. 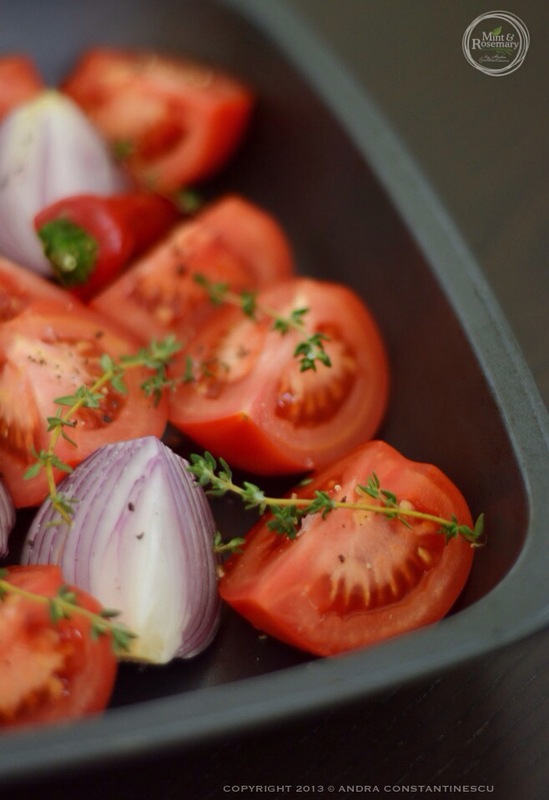 Cover the pan with foil an place it in the oven for 45 minutes, until the tomatoes and the onion become soft. After 45 minutes, take the pan out of the oven, remove the foil and leave it to cool for a few minutes. Transfer everything, including all the juices from the pan (remove the thyme springs) into a food processor and whizz it until it becomes creamy. At the end, add the lemon juice. To serve, pour the soup into two bowls, add the cubed cherry tomatoes, the sourdough, sprinkle some lime zest, freshly cracked black pepper and some fresh thyme. So happy to meet you at Food Bloggers Connect! I love your photography and writing style. The soup looks delicious! Thank you so much India, it was lovely meeting you too!